Lythrum salicaria known commonly as Purple Loosestrife, is an interesting species native not only to Australia but widespread in Europe, Asia and North America. In Australia the species occurs in all eastern states including Tasmania. This perennial herb reaches a height of 1.5 metres and usually has a number of erect stems. Leaves are up to seven centimetres long and may be opposite or in whorls of three. Flowers are held in long, terminal spikes and are pink-purple or bluish. Flowering extends from November to May. The blooms are an eye-catching feature. 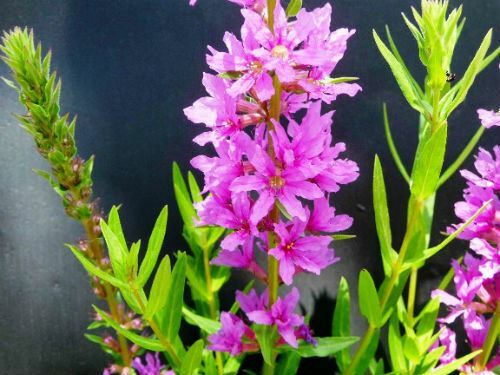 Purple Loosestrife favours wet situations such as swampy ground and is said to survive in drier areas. In our cold climate garden we grow this species in our ponds. We have had no success growing plants in dry areas. This is an ideal plant to grow in aquatic environments. Our plants usually die down in winter but bounce back in spring.